Sunn hemp (Crotalaria juneca) has been showing up in summer annual mixtures across the country. Its quick growth and ability to fix nitrogen make it a good candidate for mixtures with sorghum, sudangrass, and millet. Sunn hemp is drought tolerant and can handle moderately low soil pH, making it an excellent choice for acidic soils. Sunn hemp can be grazed by cattle, goats, and sheep. Historically, sunn hemp and other warm-season legumes have been considered excellent forbs for goats and other small ruminants. For this reason, they have been largely ignored by beef and dairy producers. However, under proper forage management, sunn hemp can have a nutrient profile that is excellent for stocker and finisher beef cattle, as well as pasture-based lactating dairy cows. In pastures, start grazing sunn hemp when plants are 1.5- to 3-feet tall, approximately 45 days after planting. The leaves are high quality (see table), but the stems are considerably lower quality. However, the stems provide the fiber needed for proper rumen function. In order to maintain forage quality, maximizing the leaf-to-stem ratio is important. A field allowed to grow until flowering may lose lower leaves and have reduced forage quality. 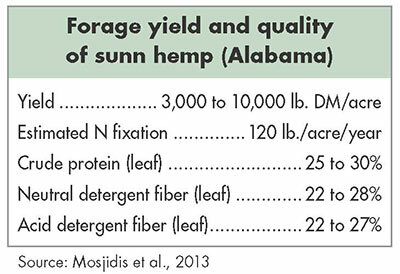 When sunn hemp is at 80 percent bloom, only 35 to 40 percent of the field biomass is leaves. To ensure forage quality, early grazing is important. Rotate livestock out of the field once the forage has reached 12 to 18 inches. Due to its very high quality, sunn hemp is well suited for limit grazing (one to three hours per day) in combination with warm-season perennial pastures. At first, livestock may not find sunn hemp palatable, but within one to three days, they will develop a “taste” for sunn hemp. If sunn hemp is grazed too early, livestock will overgraze, possibly killing it. If plants are grazed too high (6 feet), the livestock will break the plants and the sunn hemp will not regrow. Mowing or grazing sunn hemp to less than 12 inches can prevent plant regrowth. It is not suggested to cut sunn hemp for hay or silage. Once the soil temperature has reached 65°F, sunn hemp can be planted into a prepared seedbed. Research in central Alabama has shown that maximum forage yield (7,800 to 10,000 pounds of dry matter per acre) occurs when it is planted in mid-June. Plant 25 to 30 pounds of pure live seed per acre and inoculate with a cowpea-type inoculant. Seed at a depth of ¼- to 1-inch. Due to its wide tolerance of soil pH (5.0 to 8.4), liming is generally not necessary, but it is recommended if needed. Nitrogen (N) fertilizer is not required as sunn hemp is a legume, but add phosphorus and potash based on soil test results. Sunn hemp grows best in sandy, well-drained soils. It is not tolerant of standing water or heavy, clay soils. During the first 30 days after planting, it will have little above ground biomass production. However, by day 60, plants can be 6-feet tall. In order to maximize the length of the grazing season, plantings of sunn hemp can be staggered (May and July). This allows for a higher quality forage throughout the grazing season and into early fall. Its high crude protein content complements summer annual grasses, which are typically higher in sugars. In addition, because it fixes nitrogen, you can reduce the amount of N fertilizer that is applied to these mixtures. Sunn hemp is in the genus Crotalaria, which is characterized by the presence of pyrrolizidine alkaloids in the seeds. Sunn hemp contains only low levels of two to three different alkaloids. Non-ruminants are more susceptible to acute toxicity from ingesting seeds compared to ruminants. It is not suggested to feed the seeds; however, the consumption of a small amount of seed while grazing will not cause acute toxicity in livestock. Leaves and stems of sunn hemp have not been found to be toxic to any class of livestock. Many of our summer options do not produce the forage quality necessary to maintain a lactating dairy cow, a stocker, or for a finishing beef diet. This leaves producers feeding stored forages and feeds during the summer slump (July to August). Using a combination of summer annual grasses (for example, sorghum or millet) with a high crude protein forage like sunn hemp can provide a more nutritionally complete diet for pasture-based animals through the summer months. This article appeared in the August/September 2018 issue of Hay & Forage Grower on page 30.